first off, what's up with the hype in the release notes? 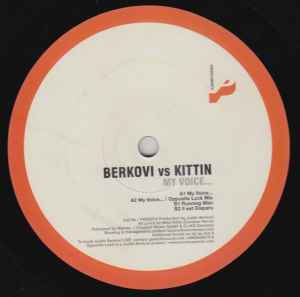 this is a exceptionally weak release for berkovi, who really hasn't been himself in terms of quality control, at least since "you're so alien". miss kittins boring vocals don't really amend anything, this is a piss poor attempt at cashing in on the hype that sorround(ed) the two at the time, who knows if it paid off, I sure hope it didn't. Miss Kittin is the unstoppable voice that everyone wants a piece of - here she teams up with Justin Berkovi with amazing results! From the menacing 808 electro of 'Il Est Disparu' to the rolling Detroit heavy 'Running Man' and the deep tech-house groove of 'My Voice', this excellent EP moves from the dancefloor into the head in a unique and refreshing twist for both protagonists!.